I was quite looking forward to getting back out the pond again as it’s still fishing it’s head off with 30lb plus need to win and you need over 20lb to frame. 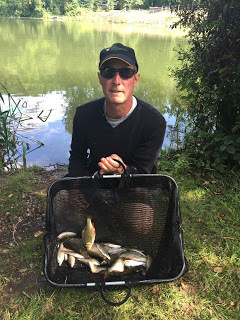 I got it badly wrong in the last match I fished when I had just shy of 14lb of roach on the pole and got battered by people catching plenty of bream and skimmers on the feeder. I found my feeder rod and a reel but after searching everywhere I couldn’t find where I’d put my feeders after switching seatboxes from my Tardis to the Matrix. Luckily Hurf and Rob said they’d lend me a couple, cheers chaps! I got to the Oak in plenty of time for the draw and had one of Steve’s excellent sausage sarnies to set me up for the day. Rob announced the golden peg was number 1 so there was a good chance it could go today, but by the time I stuck my hand in the hat, Fieldy had already drawn it. My home for the day was peg 6 and I was a little concerned that the overhanging tree might prove a pain when trying to fish the feeder. 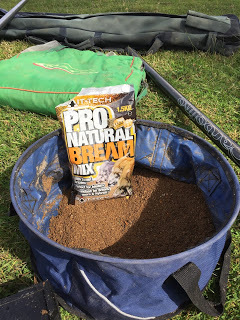 After setting my box up and mixing some groundbait (Bait-Tech Pro Nat Bream), I was struggling a little bit to get the rest of my kit set up in time (partly due to having to work out where the reel went and then thread line through rings on the rod, what’s that all about?). My feeder rig consisted of a cage feeder (borrowed off Hurf), 0.12mm bottom to a size 16 Kamasan B911 with a hair rigged band. I just about had time to set up a shallow rig consisting of a Preston Chianti with spread shot to 0.10mm bottom with a size 18 Middy 63-13, elastic was Daiwa yellow hydro which I find just perfect for catching silvers and used with a pulla bung it will handle the odd better fish that comes along. Rob signalled the start and I put a 8mm pellet in the band, scooped up some casters before plugging both ends with groundbait and casting out. I was clipped up to fish not too far out, probably 25 metres or so. First chuck, I tightened up and the tip flew round and I was soon netting a greedy 6oz rudd, a decent start. I then spent ten minutes sorting out a horrendous birds nest around the reel (you don’t get that with a pole! 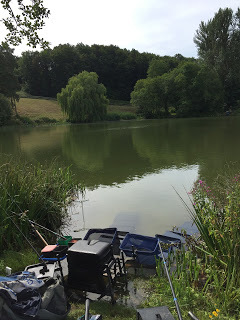 ), on the next cast the feeder didn’t even reach bottom before the tip jagged round and this felt like a better fish, it turned out to be a foul hooked skimmer which came off at the net – great! But then after initially feeling like there were a few fish about, I couldn’t buy a bite! I was getting a few knocks and taps but it just wasn’t happening and I was starting to get fed up with this feeder malarkey already, I’d been feeding hemp and casters at 10 metres and there were fish swirling for it and I didn’t think it would be long before I was reaching for the pole. I hadn’t seen much being caught around the pond and to be honest the bright sunny conditions probably weren’t ideal for bream. Bob wandered up from peg 9 and said he was gutted as he’d just lost a near 3lb perch at the net. After an hour and a quarter I had a really positive bite which resulted in a decent skimmer but it was a one off. I even tried banding three dead maggots but apart from a decent rudd on the drop, this was a waste of time as well, so with two hours gone, it was time to try the pole. I started catching roach on caster but despite loads of decent fish swirling I was only getting the 1-2oz fish but stuck at it as nobody else seemed to be catching. I was getting fish in spells so I started feeding a line just off the reeds at 6 metres and swapped between the two, I was getting quite a few small perch from the shorter line and was starting to get a little concerned at the lack of quality. 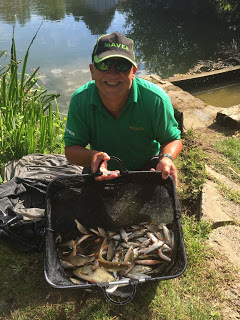 Bank walkers were saying nobody was bagging and that Stu Alford and Rob had caught some skimmers on the feeder early on but had slowed right up and around the pond quite a few anglers who’d started on the feeder were now fishing the pole. I was still missing loads of bites and even tried banded caster but despite the float sailing away every put in, I never hooked a fish on it! Justin Charles came for a wander round with his dog and said that Bob had landed a nice bream but most people were struggling. As we headed into the last period of the match, my swim seemed to be getting stronger and I was getting a roach nearly every chuck and the average size increased as well, including a couple of clonkers around the 10-12oz mark. When Rob called the all out my clicker was reading 144 fish which I thought would give me 9-10lb of fish but would it be enough to sneak in the frame? 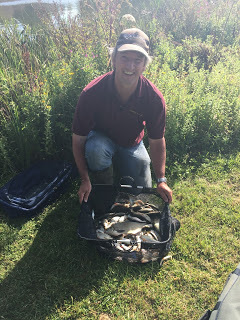 I packed up and went to give Bob a hand with the scales, Fieldy was first to weigh and gave us all his usual “I’ll be last on the pond”, “I’ve only got 6lb” but of course when he pulled his net out, there was an awful lot of splashing, his weight was called at 12lb 2oz and he was only 100% out with his estimate! I’ll be the first to admit I’m crap at guesstimating my weights but I don’t think I’ve ever been that far out! Hurf was a lot closer with his estimate and said he had around 6lb and weighed 5lb 9oz so was only 7oz out (take note Fieldy!). 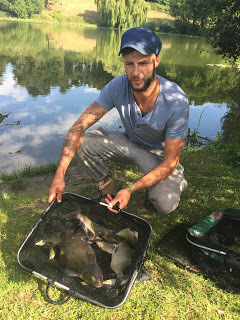 Then it was Jakes turn and he had a bream plus quite a few skimmers and it was going to be close, the needle settled on 12lb 6oz and he’d gone into the lead. He also said he lost a proper bream near the end. I was next to weigh and as I said earlier I thought I had 9-10lb possibly a little bit more and I was kicking myself for spending so long on the feeder as I felt sure it was going to cost me today. I pulled my net out and it looked like it was going to closer than I thought, the needle finally settled and my weight was called at 13lb 2oz and I’d just edged Jake. 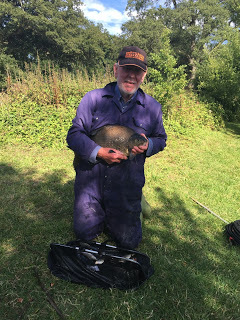 Bob had 8lb 14oz which included a lovely bream that had to be 6lb and he was still cursing that lost perch! So I’d won my section at least and would have to wait and see how the other section had got on, I knew Stu and Rob had both caught some skimmers early on but had they added any more? Back at the results I asked Stu how he’d got on and he said he’d weighed 12lb 9oz and was top in the other section so I’d won! I picked up £43 plus a pound off Hurf, although I don’t think he was too bothered as he flies out to Thailand on Tuesday, lucky bugger! So a very enjoyable day and it had been a really tight match with only a pound separating the top four weights! I’m still none the wiser on how I’m going to approach the next match though! Banded casters – you animal. Tried that groundbait on Exeter canal a couple weeks ago. It sent the tench potty but they were impossible to catch over it; too many particles for them I think. Decent value for money compared to other groundbaits. Not as cheap as TESCO value white bread groundbait though! Lol, you are the bread man!